Didn't get the Kindle that you wanted for Christmas? Well win one from me! 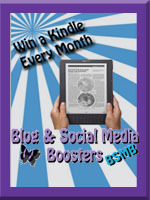 I've joined with Blog and Social Media Boosters to giveaway a KINDLE. Please use the Rafflecopter form below to enter. The giveaway ends on February 1.